Minister for State for the Gaeltacht, Dinny McGinley T.D. 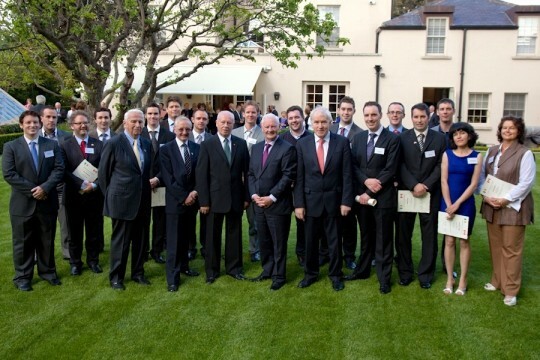 and Minister Jimmy Deenihan T.D., pictured with our host, Ambassador Hearn, the 2012 Irish Dobbin Scholars, the 2012 Irish Language Scholars, and ICUF Chairman, Prof. Seamus Smyth and ICUF Executive Director, Prof. John Kelly. It was our great honor to have Minister for State for the Gaeltacht, Dinny McGinley T.D. and Minister of Arts, Heritage and the Gaeltacht Jimmy Deenihan T.D attend the 2012 Dobbin and Irish Language Awards Ceremony, which took place in the Residence of His Excellency Loyola Hearn, Canadian Ambassador to Ireland. It was a wonderful occasion, and we are deeply grateful to Ambassador and Mrs. Hearn, Maria O’Reilly and all the staff at the Embassy and Residence who made this such great occasion.